Out think your opponents on your own or join forces with other players for team action. The unique Historical Boards allow you to secretly lock in your answers and there are a variety of ways to cash in points. Remember, those who fail to learn fro history are doomed to repeat it! Nominated for the 2015 Spiel Des Jahrs (Game of the Year) The Game is a co-operative card game for 1-5 players. In The Game, you’ll have to work together with your friends to play cards into one of four different piles, with the hopes of discarding all 98 cards. The trick is, you aren’t allowed to tell anyone else what cards you have, so you’ll constantly be on edge as each card played could upset your best-laid plans. The Grafting Lab represents state-of-the-art bio enhancement facilities that go far beyond simple gene manipulation and accelerated evolutionary extrapolation. Using the science of grafting, we are able to enhance the human frame and structure and even graft organic and non-organic weapons directly onto the subject. These advancements have allowed for unparalleled feats once only dreamed of! While the ethical ramifications of this new science are still questionable, the boost they have brought to our battlefield capabilities are unmatched. Chronicles of the Gatekeeper, is a new adventure supplement for the Star Wars®: Force and Destiny roleplaying game. Within the pages of Chronicles of the Gatekeeper, Game Masters will find thorough descriptions of locations and adversaries, alongside suggestions for optional encounters and knight-level play, in which characters begin the game with advanced Force powers and skills. There’s also plenty of support for navigating the characters’ growing ability to foresee future events and the future actions of NPCs. For players and Game Masters alike, Chronicles of the Gatekeper offers new challenges and several sessions of thrilling adventure. Chronicles of the Gatekeeper is available now at The Wandering Dragon! 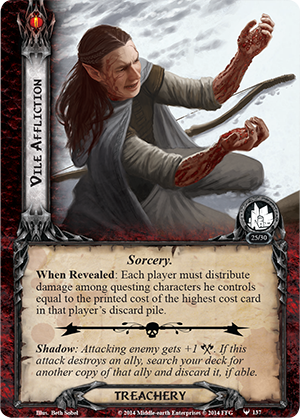 The Battle of Carn Dûm, is the fifth and penultimate Adventure Pack in the Angmar Awakened cycle for The Lord of the Rings: The Card Game! 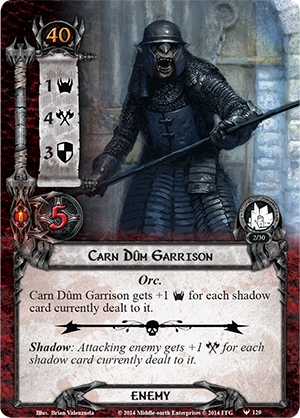 With its sixty new cards, The Battle of Carn Dûm introduces a challenging, combat-intensive scenario that takes your heroes into the heart of Angmar where you’ll need to fight your way through hordes of Orcs and other creatures in order to prevent an ancient evil from returning to the world. However, if the walls of Carn Dûm and the raw might of the assembled Orcs and Werewolves aren’t enough to slow you, you’ll still need to deal with the dread Captain that leads them and the foul and shadowed Sorcery that fills the air. 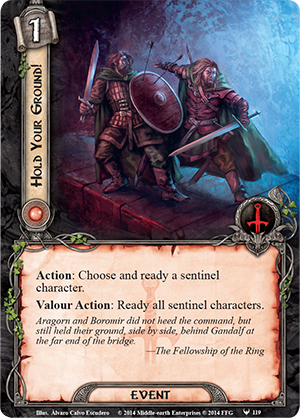 Aided by Elrond’s counsel, your heroes march to Carn Dûm with a specific mission: they must stop the fell ritual that Angmar’s sorcerous Captain seeks to complete. Should they fail, the North will once again suffer the presence of one of its greatest evils, a powerful Undead sorcerer long lost to the world. The Battle of Carn Dûm unfolds over two quest stages. Throughout the first stage, your heroes must battle their way through the fortress walls and past its Orc defenders in order to confront their Captain face-to-face in its second stage. All the time, shadows continue to spread across the land. This means every shadow card dealt to an enemy in the staging area becomes meaningful, and it means that if you engage an enemy like the Carn Dûm Garrison (The Battle of Carn Dûm, 129) to gets its threat out of the staging area, you can’t simply discard its shadow cards by using Feint (Core Set, 34) to cancel its attack. Worse yet, many of these shadow effects can hit you in surprising fashion, dealing blows far worse than the loss of an ally or a wound to one of your heroes. You may be forced to raise your threat, you may find Orc reinforcements flooding the battlefield, or you may see key cards suddenly stripped from your hand. Carn Dûm is a dark and sorcerous place, and the scenario’s fell magic reaches beyond the traditional boundaries for encounter card effects. You may even find that this dark sorcery is capable of ripping cards straight out of your deck! 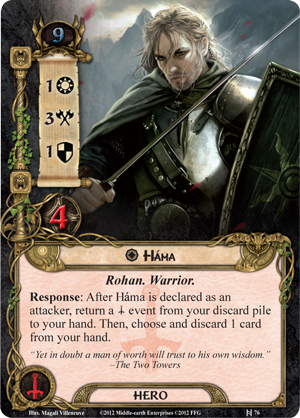 Even as it introduces its epic, combat-laden scenario, The Battle of Carn Dûm introduces a new Dúnedain Leadership hero and three copies each of nine different player cards. These include two new events with the Valour trigger, and a neutral attachment to support the Valour mechanic, especially in the face of such threats as you’ll face at Carn Dûm. Valour effects trigger only when your threat level is at or above forty, meaning that you’re likely at that point where the game stands on a razor’s edge as you push forward to the final confrontation. At forty threat, you’re only a couple of slips away from elimination, but if you don’t back down from the situation, the ability to trigger yourValour effects may give you the winning edge in the heat of battle. These effects gain shape and impact throughout the Angmar Awakened cycle, and the two events that come with Valour triggers in The Battle of Carn Dûm are easily two of the most impactful, Doom Hangs Still (The Battle of Carn Dûm, 117) and Hold Your Ground! (The Battle of Carn Dûm, 119). At five cost, Doom Hangs Still is at the top end of the game’s cost curve, and it comes with two different effects, both of which are the sort you’d expect from a card of its cost. Played normally, Doom Hangs Still prevents players from raising their threat if they quest unsuccessfully. 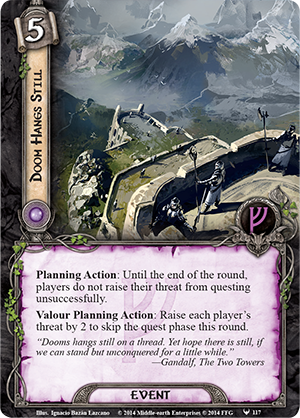 Given that you’re probably not planning to quest, clear a location, and travel to a new location on a turn where you’re spending five resources to ensure that you don’t raise your threat from failing to quest successfully, Doom Hangs Still is most likely reserved for those occassions when you simply do not wish to commit characters to the quest. You’ll still reveal cards from the encounter deck, but the event gives you a turn to focus all your efforts on dealing with the enemies in play, holding back all of your characters to attack and defend. However, if your threat is at forty or higher, you can play Doom Hangs Still for itsValour ability and skip the quest phase entirely! You have to raise each player’s threat by two to do this, but you won’t reveal new encounter cards. You’ll have a turn to concentrate all your efforts against the enemies currently on the table, and in scenarios that require you to defeat a final boss enemy, this might be the trump card that focuses your fellowship and brings your quest to its triumphant close. Of course, Doom Hangs Still is only going to turn a game around for you if you’re able to successfully defend and attack the enemies in play. If you need to exhaust all your characters just to survive the attacks your enemies make against you, you might not have anyone ready to defend. However, this is where Hold Your Ground! can help. There are already a great number of cards that ready characters, and one resource to ready a character is already on the more expensive side of those. Still, the card is worth inclusion in the right decks because of its versatility. The first thing to note is that it readies a sentinel “character,” not just a hero. Far more cards ready heroes than ready allies, so the fact that Hold Your Ground! allows you to ready either a Sentinel hero or a Sentinel ally is an important consideration. More than that, though, is the fact that if you trigger its Valoureffect, the card allows you to ready all Sentinel characters in play: your Sentinel heroes, your Sentinel allies, and all those belonging to your teammates. This means that for just one resource, you and your teammates can commit all of your Sentinel characters to defense and then use them all to attack, or you can commit them all to the quest and then have them ready to defend. Finally, because it only costs one resource, and because it’s a Tactics event, you could very easily envision a situation in which you play it twice in a phase and recover it with Háma (The Long Dark, 76) to use it again in the next round. Still, the more you play at a high threat level, the closer you come to finding yourself eliminated at fifty threat. That’s why The Battle of Carn Dûm also introduces Favor of the Valar (The Battle of Carn Dûm, 124), an attachment that empowers the Valour archetype. 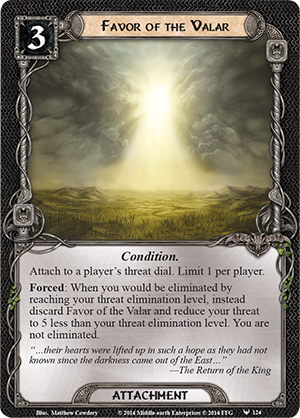 Favor of the Valar attaches to your threat dial, and whenever you would lose via threat elimination, it saves you, resetting your dial to five less than your threat elimination level. Moreover, while it’s limited to one per player, it’s not limited to one copy per deck, so you can attach a second copy to your dial as soon as the first is discarded. In this way, you can buy yourself a number of rounds of play at high threat levels, allowing you to trigger your Valour effects even in the face of the greatest evils imaginable. 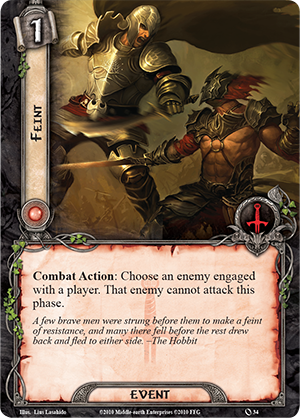 With its new Valour effects and the epic confrontations of its new scenario, The Battle of Carn Dûm is sure to add tension, drama, and high heroics to your games of The Lord of the Rings: The Card Game. This penultimate Adventure Pack in the Angmar Awakened cycle is now at The Wandering Dragon! Vlaada Chv’atil’s Hit Party Game is back in stock at The Wandering Dragon!